Keeping sane in your PhD: What can you do? What can UU do? Prout, UPP, the University Council and the Graduate School of Life Sciences are co-organizing a symposium on PhD mental health. The goal is to stimulate an inspiring and constructive discussion on PhD mental health. We want to share tips and ideas on how PhDs can better take care of themselves, and to discuss what can be done at the university level to improve PhD mental health and well-being. You can also follow the Facebook event. The event is co-financed by Prout, the University Council and the Graduate School of Life Sciences. Here are the main tips and ideas discussed in the symposium, and here the presentations. 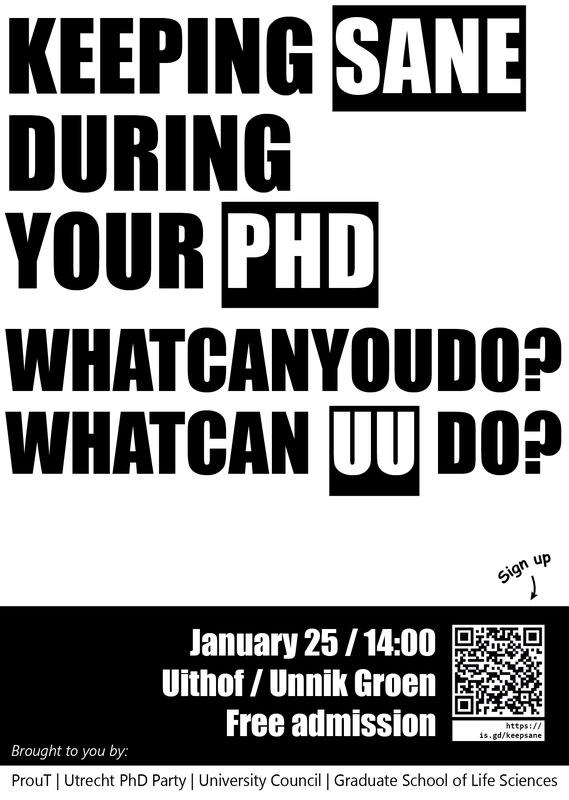 You can also check the article “Problems in your PhD?” that we prepared last year.